Merry Christmas. Kmart Catalogue has a nice outdoor toy range. Trampoline is a classic idea for sure. However, it's one of the most popular entertainment among all kids. 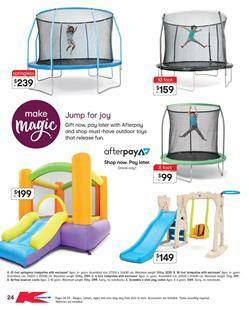 Find some deals on pg 24 for three different trampolines. Also, two play centres are available for lower prices of the retailer. You can check out the discounts on more outdoor toys. Such as basketball system. Help your kids get more active with a portable adjustable height basketball system. Having several of these in your backyard will keep kids busier than ever. Check out those toys and entertainment products on pg 25. Enjoy the summer with a pool or inflatable floating toys on your pool. You can get something from the bike and scooter section as a Christmas gift. Kmart has exclusive products such as Minnie Mouse 6V mini quad ride on. Tether ball splasher is also one of the favourite products of the toy sale. My favourite item is the Huffy Green Machine. That might be the coolest thing ever on a toy sale catalogue published by the retailers like Kmart. That's not all products from outdoor toy sale. Find all the products in the catalogue. Also, see the new Kmart Catalogue that has more gifts for Christmas.